Fantasia (1940), Walt Disney’s grand experiment in marrying classical music to cutting-edge animation, initially flopped at the box office. Highbrow critics deemed the film’s “cartoony” elements demeaning to the works they accompanied by Bach, Beethoven, and Tchaikovsky. Mainstream audiences largely found the whole notion baffling or even brain-injuring. Fantasia, of course, proved to be cinema’s first “ultimate trip." As such, it attained new glories when watched while under the influence of drugs. Maybe Disney would have been okay with this, or maybe not. 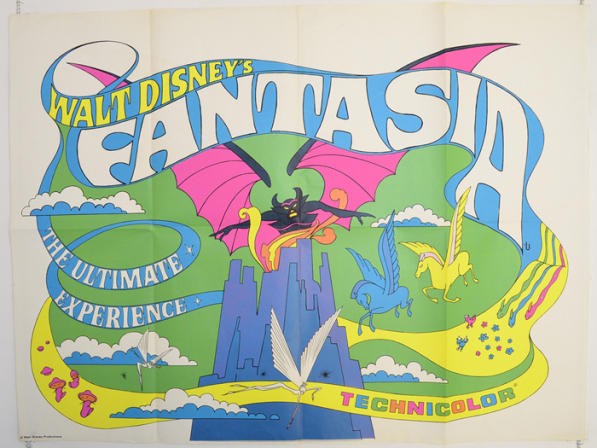 Either way, by ’69, the studio that bore Walt’s name smelled green among all those fumes at Fantasia showings and dove into hippie marketing headfirst. Noticing the mind-blowing business done by the Beatles’ psychedelic musical cartoon feature Yellow Submarine (1968), Disney Studios gussied up Fantasia for a massive re-release that would be sold expressly to stoners, rockers, and acid-eaters. That strategy proved to be even more of a smash. As step one, Disney artists rendered a pink-and-purple poster modeled after druggy concert promos made famous by rock venues such as the Fillmore. The poster is a blacklight-ready eye-popper centered on a blob image that contains the devil from “Night on Bald Mountain,” dancing mushrooms, soaring Pegasus rompers, and fish streaming colors behind them, bordered by dripping letters that spell out the names of the soundtrack’s composers. There’s even a subliminal Mickey Mouse. There's no mistaking the intended customers. Nearly a quarter century after dumbfounding the public, Fantasia drew huge crowds, finally made it into the financial black, and remained an often-booked midnight movie throughout the next decade. The erstwhile flop movie has since generated a video game and a sequel, Fantasia 2000. 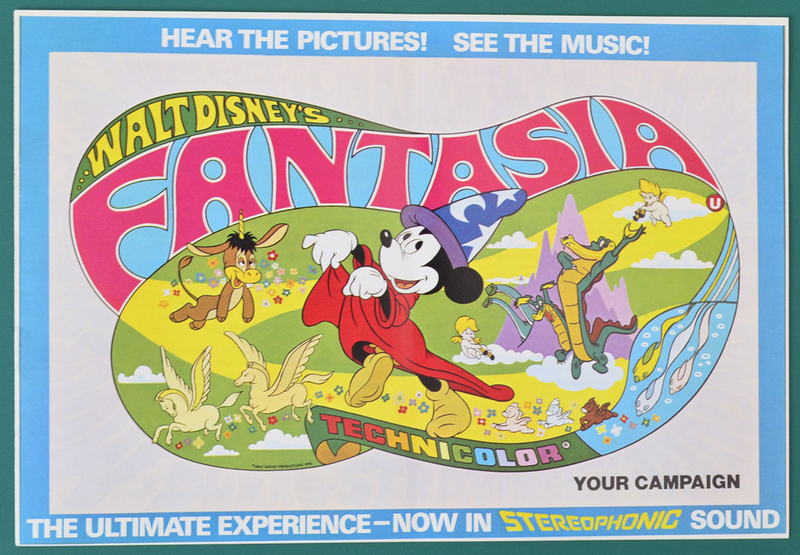 Rumors have long swarmed that perhaps Fantasia had come out of Walt Disney’s own chemical experimentations, particularly with mescaline. The same year he released Fantasia, Disney undertook the surreal short "Destino," teaming up with no less a mind-expander than Spanish art visionary Salvador Dali. The project remained uncompleted in their lifetimes, due in part to Fantasia's financial woes, but was finished by studio animators in 2003. So did Uncle Walt trip balls to come up with Fantasia's evil broomsticks and ballet dancing elephants? There's no way to know. The Firmament (Renzo Gorrio, Mark Golton) and special guest composers Andrew Vickers and Richard Haig are excited to return to SF IndieFest for the third time, performing their most ambitious film re-score to date! Prepare to be enchanted and amused as you experience an iconic movie in a unique way--screened silently, accompanied by an all-new soundtrack, performed live by The Firmament. Renzo Gorrio composes music and does sound design for WNYC's Snap Judgment. Renzo also releases music under the alias Hydroplane. His latest full length release, Panda, is on Schematic Records. Mark Golton djs with the infamous Brass Tax crew and has gained popularity promoting, throwing and dj-ing parties in virtual reality most notably with Echo Space, virtual reality's most popular dj dance party. Andrew Vickers is an acclaimed composer who writes in multiple styles. Although his true passion is Classical Composition, he writes and collaborates extensively in multiple musical styles and performs live regularly with funk band Mango Bus. He is also premiering a Piano Quintet in NYC next spring. Richard Haig creates music under the name Panic Bomber and has written and performed with an eclectic background including the New World Symphony Orchestra. He currently produces music for Smule. The last two Firmament events at SF IndieFest, “MAD MAX FURY ROAD - BLACK & WHITE” and “AKIRA LIVE,” sold out rapidly--so get your tickets now to ensure your place at this cinema celebration.